Are you planning your next adventure? if yes, then this article will be useful! I have gathered some of the best travel accessories and gadgets available today. From an ergonomic portable pillow to a solar powered charger to an inflatable wine holder, these items are designed to aid the broad spectrum of enthusiastic explorers. With such an extensive range of innovation available to travelers, it is often overwhelming to consider which items are necessary. A vast majority of people can relate to concluding their holiday to find a useless gadget packed in their luggage. They are often unused for the entirety of their trip. For this reason, the following information has been broken into categories to help you to determine which items are more relevant. We begin, unsurprisingly, with the departure. Whether you are traveling by plane, bus, train or donkey, it is always important to have somewhere safe to keep your valuables. A padlock is always useful to secure your belongings and for those of us prone to losing our keys, a combination lock could be the more prudent solution. A length of security cable provides added flexibility, particularly useful if you will be using shared accommodation, as it will allow you to secure your luggage while you are absent. Along with security, it is important to be practical and realistic about the size of the luggage you will use. If there is a potential for your baggage to exceed the allowable weight, a digital luggage scale can save you a lot of hassle before you leave the house. For the budget travelers among us, consider whether your poor bag will cope with seven (or eight, or nine) kilograms packed into its narrow fabric. I can tell you from experience, a strong backpack is a worthwhile investment, your spine will be very grateful and you will avoid the embarrassment of having your luggage explode in the middle of a busy intersection (true story). If you have breakable items, specific, inflatable padding is now available to protect fragile belongings (a bottle of rum, for example). Finally, if your baggage is not waterproof, it might be wise to invest in a couple of dry sacks to preserve your valuables and electronics. You never know when your precious travel companion might be exposed to the elements. Now that your bags are safely packed and secured, let’s focus our attention on you, the traveler. The fluffy industry of travel pillows has advanced over the years, and you can now purchase a whole range of different shapes, sizes and stabilities. If you are a fussy sleeper, the more elaborate ergonomic options could be practical, particularly when paired with ear plugs, a portable blanket or an eye mask. If all else fails, perhaps pack some sleeping pills and a collapsible water bottle to wash them down. Right, with all of the tools to keep you comfortable, we can shift our focus to entertainment. If you are traveling in style, you should be provided with a power source to charge your phone. However you may require an adapter to access it. As an alternative, consider packing a solar power bank, this technology is evolving at an impressive rate, becoming lighter and more efficient. There are also progressive alternatives which utilize sunlight as an energy source. Upon reaching your destination, the initial concern is navigating through a new location to find your bed for the evening. You may not have an internet connection when you land, so an offline navigation application (such as MAPS.ME) is often useful. If you plan to do a lot of trekking on your trip, then perhaps a portable GPS would also come in handy. We are becoming increasingly reliant on technology, but there is always a chance that your phone will fall in a puddle or decide to take a holiday of its own. 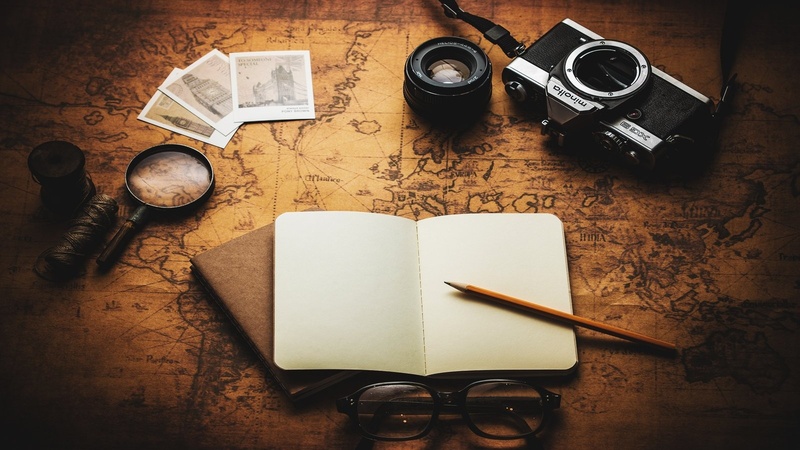 Plan ahead, have a backup option, bring a pen and paper, write down the address of your hotel and perhaps even bring a map or a guidebook for the area you are traveling. If you are considering budget accommodation or camping, think about bringing a microfiber towel and perhaps also a portable laundry bag to keep your clothing reasonably clean. A rechargeable reading light is also a useful addition for the bookworms among us. To ensure you have access to purified drinking water throughout your travels, the Lifestraw is a brilliant invention. This innovative filter allows you to drink up to one thousand litres of water. Which unless you are very thirsty, should cover the duration of your trip. Many of us like to create digital memories during our travels. We keep a diary, take photographs or film the environment around us. If you are comfortable utilizing your phone for this purpose, several attachable lenses are now available to drastically improve the image quality of this device. An action camera can be a worthy investment for those considering adventure sports. Whichever device you are using, taking a stable image can sometimes be a challenge, investing in a portable tripod or a selfie stick may avoid the hassle of filtering through a collection of blurry memories. There we are. I hope some of these suggestions might contribute to the success of your next adventure. If you can think of any further additions. Please add them in the comments section below. Your interaction would contribute to the value of this article and could prove very useful for someone pondering their departure.